If you're planning on building your Wrangler JL up with aftermarket accessories and add-ons, there's a good chance you could be adding extra weight. 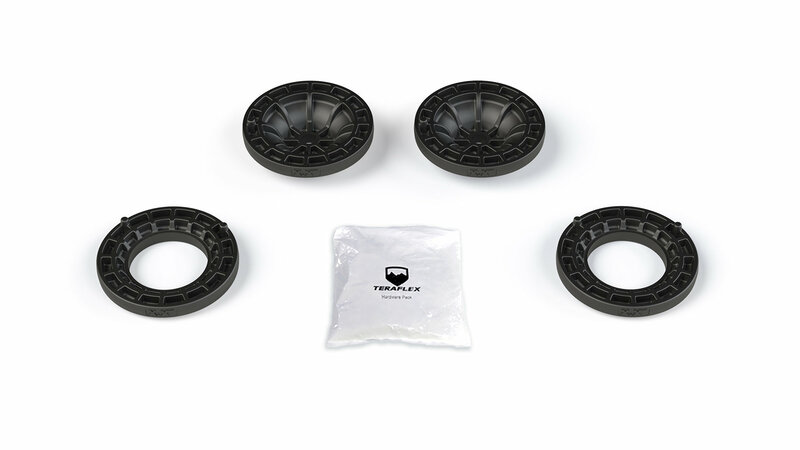 Things like winches, bumpers, roof racks, spare tires are all going to put a little extra stress on your suspension, so Teraflex has designed their .5" Load Level Spacer Kit to compensate for that extra weight without lifting your Wrangler too high. Choose whether you use only the front, rear, or all four spacers on the front and rear. *Note .5" Load Level Spacer Kit will provide .5" of additional height to stock Wrangler 2-door & 4-door model Jeeps. Flexible Fitment Options make it possible to install only the front, only the rear, or all four spacers. Maintain Stock-Style ride height even with heavier aftermarket gear installed.